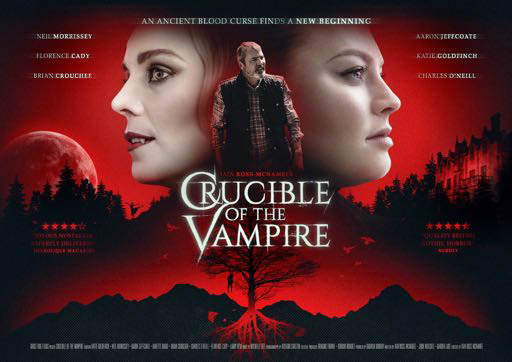 Crucible of the Vampire starts as it means to go on; with a confusing flash forward to the end of the film immediately followed by a jump back in time to the 1600s. To suggest that this is all a bit ramshackle is understating things as this is a story that barely even features a vampire and only vaguely has a crucible. The titular metal working tool is actually an ancient cauldron that is cut in two by a witch hunter’s sword in the opening prologue. Was its former owner really using it for black magic? Do swords really cut through heavy objects like this so easily? This is a story that poses a lot of these sorts of questions but rarely gives satisfying answers. Although the flashback is quite dramatic and recalls the films of British studio Tigon, to suggest this at all resembles a classic folk horror from the 1970s would be really stretching things. There’s no real sense of creeping dread and the whole thing lacks atmosphere in general. Most of the time it just feels like another cheap video on demand release which shouldn’t really be getting any sort of theatrical screening. It’s almost entirely shot with flat handheld camera work and a bland overly lit style. Even at night when characters have to use torches to see it feels like the early afternoon because of the lack of any actual darkness. To create tension it relies instead on overly loud music… but most of the time there’s no horror mood at all. This is a shame because the main part of the action takes place in a spooky old mansion inhabited by a pretty strange family of eccentrics. It’s a perfect setup for this kind of story whether it’s being haunted or cursed. But the setting is filmed with the same lack of style which drains it of any ominous feelings. It just looks big and empty rather than cold and isolated. By the time the first act comes to a close this place has worn out its welcome instead of being a real character in the story. Old school Hammer Glamour might have been done on a shoe string budget sometimes but at least they managed to put together a chilling yarn in a Gothic location fairly effortlessly in most cases. Here it’s just a backdrop for the actors to go through the motions in ways that are often repetitive instead of intriguing. Isabelle (Katie Goldfinch) is a junior curator sent out to the countryside to investigate a strange find – the missing half of the cauldron which was apparently lost years earlier. It’s in the hands of Karl (Larry Rew) a strange mansion owner who wants to sell it to her museum so they can at last own both halves and he can pay for restoration work on the building. Why Isabelle is sent out alone to do this work is unclear, but then I’m no expert on archaeology or metallurgy. Maybe museum curators often go to dig up finds without any equipment or a proper crew. She spends several days looking at the piece and occasionally dusting off soil with nothing but a small brush, but it’s not long before Karl’s family start to behave rather oddly. There’s a lot of awkward expository dialogue as things move between the supposed work at the dig site and the spooky nights in the mansion. Things get weird fast as Karl’s wife Evelyn (Babette Barat) pressures Isabelle to drink home-made tonics and his creepy daughter Scarlet (Florence Cady) pressures her into her bed. Even without the possibility of hypnotic supernatural influences Isabelle is far too quick to give in to any sort of demand, even when it’s just going out alone to a local pub so she doesn’t see Karl talking to suspicious people in the house. The actual plot really drags for what is an incredibly long ninety minutes, punctuated only by a handful of dream scenes and the occasional hint Karl is up to no good. The whole thing would be pretty lifeless it wasn’t for a ghostly 1800s flashback half way through and a possible Spinal Tap reference when caretaker Robert (Neil Morrissey) says his predecessor died in a mysterious gardening accident. But isn’t this a vampire film you ask? For the most part, not really. If anything it’s more of a haunted house story with the occasional tangent into black magic and necromancy as Karl and his friends attempt to give power to an ancient evil. Isabelle meanwhile continues to go along with most of this, giving in to his request to see the other half of the cauldron and then drinking yet more suspicious home-made liquids. Her actions and his plan are often illogical even by creaky horror film standards. The central family are interesting in a way but they should have been given more story relevant actions in a tale that is all too vague and tepid. It takes almost an hour for any blood to be drawn and even then the narrative just meanders towards a dull climax chase sequence. Even with random title cards to break everything into chapters there’s no sense of pacing and it just feels like episodic without purpose. The ethereal powers that do eventually manifest themselves are inconsistent ranging from eyes glowing in the dark to ghostly nocturnal forms conjured by piano music. In one instance they even interfere with a telephone boxes somehow. I appreciate the intentions of film makers who may have wanted to do something with a little class; but the execution of the whole thing is leaden and lethargic.